Slip into this sophisticated slide and experience optimal comfort and style. Croc print leather upper and covered heel. Excellent arch support. Footbed is padded and lined with leather. Combination leather and slip-resistant sole. 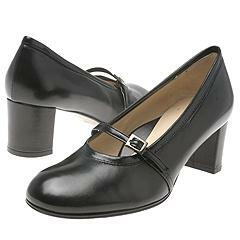 A maryjane inspired pump that proves shoes can feel as great as they look! ; Soft leather upper and full leather lining. Cushioned footbed with excellent arch support. Taryn Rose logo detailing on the butterfly constructed sole. Taryn Rose changed the footwear industry in 1998 by creating a line of luxury shoes that are as comfortable as they are beautiful. Her idea of being well-dressed with a sense of well-being touched a nerve with fashionable women from coast-to-coast, creating a dedicated following for her footwear collection. Formally trained as an orthopedic surgeon, Rose saw patients with many serious foot problems that were caused by fashion footwear, high heels and pointed toes. Being a lover of beautiful footwear, her own feet ached after 14-hour days in shoes with three-inch heels. In the fashion world where beauty and pain go hand-in-hand, Taryn Rose offers women the opportunity to wear exquisite footwear which is also good for their feet.